For the Expo 2015 project we decided to talk about street food. So here you have some information about a typical British street food: fish and chips! No one knows exactly where or when fish and chips came together. Chips arrived in Britain from France in the eighteenth century. The first mention in 1854 was when a chef included in his recipe book ‘thin cut potatoes cooked in oil’. Around this time fish warehouses sold fried fish and bread, and Charles Dickens mentioned them in his novel Oliver Twist published in 1830. 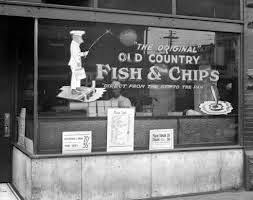 There are claims to the first ‘chippie’ (fish and chip shop) from Lancashire in the North and London in the South of England. The trade grew to feed a rapidly expanding population during the Industrial Revolution. Fish and chips also helped feed the masses during the First World War and were one of only a few foods not rationed in the Second World War. 1. In a large bowl mix together the all but 2 tbsp of the flour, cornflour and baking powder. Season lightly with a tiny pinch of salt and pepper. 2. Using a fork, and whisking continuously, add the beer and the water to the flour mixture and continue mixing until you have a thick, smooth batter. Place the batter in the fridge to rest for between 30 minutes and an hour. 3. Cut the potatoes into 1cm slices then slice these into 1cm-wide chips. Place the chips into a colander and rinse under cold running water. 4. Place the washed chips into a pan of cold water, bring to a gentle boil and simmer for 3 - 4 minutes. Drain carefully through a colander then dry with kitchen paper. Keep in the fridge covered with kitchen paper. 5. Meanwhile, lay the fish fillets on a sheet of kitchen paper and pat dry. Season with a little sea salt. 6. Heat the oil in a fryer. Cook the chips for a couple of minutes. Do not brown them. Once they seem cooked remove from the fryer and drain. Keep to one side. 7. Place the 2 tbsp of flour reserved from the batter mix into a bowl. Put each fish fillet in the flour, shake off any excess, dip into the batter then carefully lower each fillet into the hot oil. Fry for about 8 minutes or until the batter is crisp and golden, turning the fillets from time to time with a large slotted spoon. 8. Remove the fillets from the hot oil and drain on kitchen paper. 9. Heat the oil to 200°C then cook the chips until golden and crisp for about 5 mins. Serve immediately with the hot fish accompanied by Mushy Peas or by your favourite condiment. · Place the peas in a large bowl or stock pot, the peas will swell and so need plenty of room to expand. Add the bicarbonate and cover with 300ml / ½ pint boiling water and stir to make sure the bicarbonate has dissolved. Add the peas and leave to soak overnight, or for a minimum of 12 hours. · Drain the peas in a colander, then place in a large saucepan, cover again with cold water and bring to the boil. Lower the heat and simmer for approx 30 mins or until the peas have softened and turned mushy. · Season with salt and pepper to taste and serve hot with fish and chipsor a tasty meat pie. 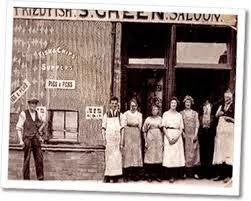 The history of fish and chips is interesting and I would like to try to eat it because I think it's a very good recipe. the site is very nice and interesting. it's so cool and interesting this experience! I learn a lots of new thinghs and it was very funny work in groups with my friends. fish and chips seems to be very taste! I'll hope eat it one day,maybe in London!. It was interesting. We learned a lot on street food and in particular on fish and chips. While we did the activity, we felt very hungry: the fish and chips' idea was very tempting! Besides quarrels on the better poster, I liked this activity very much. This experience was interesting and very nice! I liked this activity because I working with my friends! I would like eat fish and chips if I was in London! My classroom and I was very hungry! Congratulations to our teacher! It was an amazing experience because we have learned so much interesting information on the story of the United Kingdom and fish and chips. When we started to searching the recipe i wanted to eat it because it appeared so delicious. The fish & chips it's a traditional Londoner's street food and I want absolutely eat this food onemore time when I will come back in London. It was interesting discover the origin of fish and chips, and i enjoy find information with my classmates. 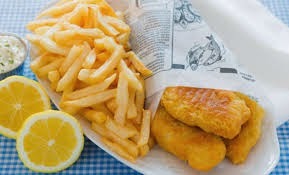 I believe fish and chips is the most original street food, and it is only of the few made with fish. 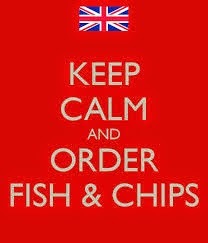 If i will go in London eat fish and chips will be my priority!